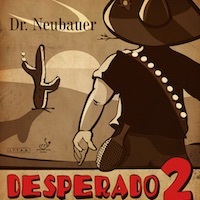 DESPERADO 2 is our latest development for a disruptive blocking game close to the table using long pimples. Since the new plastic ball comes with less spin it has become even more important to produce a consistent and effective blocking game against fast topspin balls that have little rotation. DESPERADO 2 will enable you to keep the ball low while blocking. Especially chop-blocking will give a ball that literally “dives” on the other side of the table. The plastic ball requires an active type of game with long pimples. DESPERADO 2 is a good match since it can be used easily for aggressive pushing and also slow counter-attacking. The rubber also allows for flicking over the table such as for service returning in order to put pressure on the opponent right away. DESPERADO 2 is highly effective for blocking close to the table and it is fun to play, try it out!